There are two things that pump me up about spring besides singing birds, blooming flowers and sunny weather. First, the Bachelorette. I am so excited to watch Emily (aka the closest thing to a natural, human Barbie) find “love”. Yes, it’s stupid. And we all know what’s going to happen. But I can’t help myself. And neither can the 3 million of us who tune in for like the twenty-first season of it. It will be “the most exciting season of the Bachelorette yet.” I’m just more curious about the dudes. She’s kinda boring (although sweet and gorgeous), so the boys need to bring on the entertainment. I will be sure to write my opinions/recaps here starting May 14. Now onto my other favorite springtime event- rhubarb. Oh dear goodness. I love me some rhubarb. When I saw that rhubarb was in season at the farmer’s market, I had to get some. Growing up in Seattle, you learn about this odd plant and learn to… crave it!? I’ve had it in pies, a crumble and as a jam. 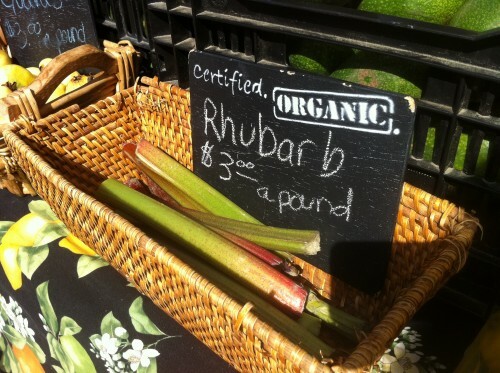 Rhubarb grows pretty well up in the great Pacific Northwest, so when I see it in the stores/markets here, I jump on it. Since I got the tart itch for some Rhubarb, I decided to grab some along with some strawberries and set out to make Strawberry Rhubarb Crunch. First, you will need some Rhubarb. Oh, goodness me, I forgot that there is a population out there that doesn’t know what rhubarb is. I will explain. Have you ever seen celery stalks in your produce section, but as you come closer you notice, they’re…. red? A reddish-pink? Those ain’t celery sister. They’re rhubarb. Rhubarb is a bitter/tart stalk that grows like a celery stalk or tall green. On a side note, according to Wikipedia, Rhubarb can be used as a strong laxative. Its roots have been used as a laxative for at least 5,000 years. Well, there ya go. I don’t have quite those effects… but hey good to know. For this recipe, you will also need strawberries. Luckily, they are in season too. Oh, I’ll just give you the recipe. In a large bowl, mix white sugar, 3 tablespoons flour, strawberries, and rhubarb. Place the mixture in a 9×13 inch baking dish. Strawberry rhubarb crunch & The Bachelorette! Be still my heart! Where are all the other comments? This post is great!